The low price of a ticket seduces many into playing the lottery, says a psychology professor. 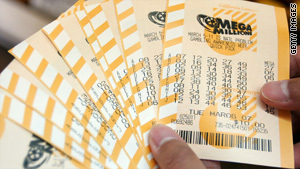 (CNN) -- Jen Bucala has a lot of faith in her family's "lucky" numbers. "I've been playing, or around playing, the lotto all my life," she says. She rattles off her numbers, citing family birthdays, and recounting numerical coincidences. "Me, my husband, my father-in-law ... all our birthdays are in November. Just a week apart from each other," says Bucala, 31. One number that did surprise her was $10,000. After some quick figuring, Bucala estimates she has spent that amount on scratch off games and Megamillions since she started playing a decade ago. For Bucala, a Lindenhurst, New York, resident who works three jobs -- as a sales associate, an Avon Rep and a bridal consultant -- that is a lot of money. "That ten grand could have gone toward a million and one bills I have -- my mortgage, car payments," Bucala says. "We spend thousands of dollars every month on bills. I don't have kids either. That [lotto] money could have been a whole month for me for bills," she says. But like a lot of people, Bucala thinks $1 is a small price to pay for a dream. "You gotta play in order to win. That's part of lotto. You never know," says Bucala. One of the seductive features of the lotto is the low entry fee says Frank Farley, a psychology professor at Temple University. What opportunities are lost because you are putting discretionary income into the lottery when you could be putting it into something else? --Frank Farley, psychology professor at Temple University. "It can be exciting, checking those winning numbers," says Farley. "Maybe something big might happen. There's not a whole lot of other things in your life where you put a small amount of money in and maybe something big will happen. It gives you a sliver of hope that you could turn your life around." And sometimes there are winners. Mineola Oaks, is retired and living in Washington Heights, New York. She has played lotto every day, spending $3-$5 a day (and more on Tuesday) for over 20 years. (Just $4 a day for 20 years adds up to almost $30,000.) Two years ago she won $100,000. And with that money she paid off her bills and did some remodeling on her second home in Virginia. Oaks still buys lotto tickets, but she cautions that there's always something else you can put the money towards. "I take care of things first," she says. "Food, rent -- Then you can go out and spend a dollar on the lotto." Just don't expect to win. Let's take Powerball for example. Your chances of winning the jackpot is one in 195,249,054 says Michael Orkin, a statistician and dean of business, math and science at Laney College in Oakland, California. Let's say you buy 50 Powerball tickets a week, you'll win the jackpot about once every 75,000 years, he says. Cold, hard numbers aside, the lotto is entertainment. "Almost everyone spends money on entertainment," says Stephen Brobeck of the Consumer Federation of America. "People spend hundreds of dollars going to a sports event. Others spend a thousand dollars a year on premium cable channels. Purchasing a lotto ticket -- it's excitement and there's always the possibility, however slim, that they will strike it rich and win," he says. Sodanys Paulino, 21, of Washington Heights, stood outside a lottery terminal one rainy Friday night. She bought two scratch off tickets and a mega millions ticket. When asked what else she could be doing with that money, she laughs. "Two dollars? You can't buy anything for two dollars," she says. But $2 a week is about $100 a year. And $100 can buy you something. The problem is opportunity costs, says Farley. "What opportunities are lost because you are putting discretionary income into the lottery when you could be putting it into something else?" he asks. "A small amount of money can be spent on dental floss," he says. The lotto sends the wrong message, says Farley. "It's hard work versus chance. The lotto says success can be built on chance." A 2005 study by the Consumer Federation of America says 38 percent of people with incomes below $25,000 think that winning the lottery represents the most practical way for them to accumulate several hundred thousand dollars. "Lower income people think their chances of winning are slim. And they think that the probability [for them to win] is greater than being able to accumulate savings over time. Peter Tufano, a Professor at Harvard Business School, harnessed this idea that people would rather have a small probability of a large payout when he came up with the "Save to Win" idea. It's part savings, part raffle ticket. And it's had major success in Detroit, Michigan, where eight credit unions have been offering it since January. Here's how it works. You open up a one-year certificate of deposit and for every $25 you save, you get the chance to win a $100,000 prize. Hank Hubbard, the director of Communicating Arts Credit Union in Detroit, Michigan, says when his credit union offered a 10 percent interest rate on a one-year CD, no one signed on, but with Save to Win, 14 percent of their membership signed up. "I am surprised at the extent of the success. We really are showing people that they can afford to save," he says. And in the very worst case even though someone may not win the grand prize, at least they've already accumulated some savings. But when it comes to playing the real thing -- old habits die hard. "I'm still going to buy my scratchoffs," says Bucala. "I'm not going to go cold turkey," she says. "No way! It's too exciting ... knowing you have the chance to win."